Every year I watch the moss patches in my lawn grow larger and larger. This weekend I decided to do battle armed with my new tool (or toy) that I ordered recently from Amazon. It’s a manual scarifier made by the company Wolf. I’m rather a fan of the German company owning several of their gardening tools including an electric lawnmower. As you would expect from Wolf it’s well designed and made to last – it’s also easy to use and very effective. Not only does it lift the moss but it also removes all the dead thatch in the grass. The lawn looks rather sad and bare as a result of my weekend’s work but I know it won’t be long before I’ll see the benefit. 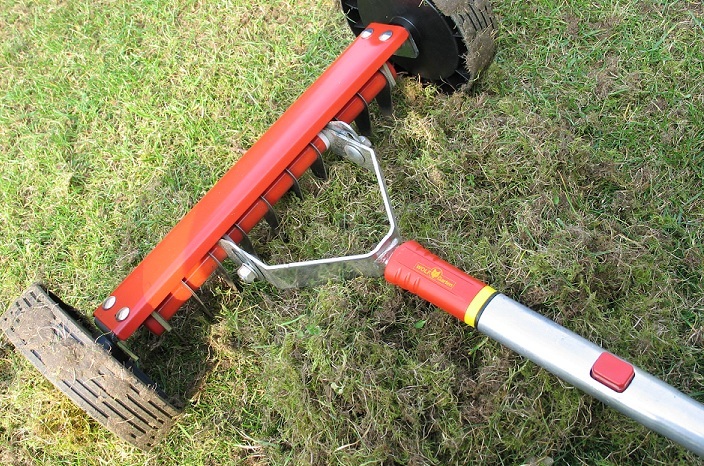 One word of warning – the Amazon reviews state that this scarifier works best on a small to medium sized lawn. I think they’re absolutely right. It’s quite physically tiring and gives a good workout to the back and arms. If you want to take a look at where I bought mine click here.